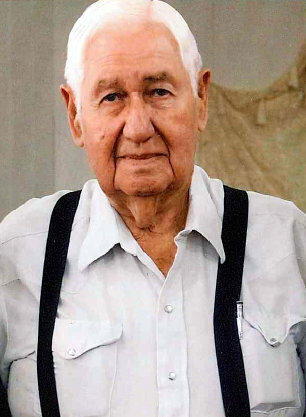 Graveside services for E.H. Carroll, 87, West Plains, Missouri, will be held at 10:00 a.m., Tuesday, April 9, 2019 at Oak Lawn Cemetery, under the direction of Robertson-Drago Funeral Home. Mr. Carroll passed away at 11:24 a.m., Saturday, April 6, 2019 at West Vue Nursing Center. He was born May 27, 1931, at Howard’s Ridge, Missouri, to Edgar Everett Carroll and Hazel Ruth Thompson Carroll. He was the oldest of 3 boys; E.H., Leon and Kenneth. On January 16, 1958 he was married to Hilda Jo Bentley-Matlock in Alton, Missouri. Along with a step-daughter, Glenda Matlock Rieck, he welcomed two sons in this union Kenny and John David. He remarried on June 5, 1971 to Lillie Maye Bunch Brandt in Miami, Oklahoma. This marriage blessed him with step-daughter Belinda (Brandt) Eldringhoff. E.H. owned and operated E.H. Carroll Construction for over 60 years. In business, he was joined by a son and in later years his grandson as well. His grandkids will remember a hint of mischief when his eyes smiled; he had a one of a kind chuckle, a keen business sense and was always ready for new people to meet and things to do. He still ate breakfast out with his buddies every morning, worked every day and went dancing a couple times a week until 86 years of age. In March of 2018, he was in an accident and then resided in West Vue Nursing Center, where he kept himself busy by cruising the halls and supervising. He is survived by a son, Kenny Carroll and wife Robin, West Plains, Missouri; two step-daughters, Belinda Eldringhoff and husband, Ben, Pomona, Missouri and Glenda Rieck and husband, Steve, Springfield, Missouri; four grandchildren, Jamie Johnson and husband, Daniel, Amanda Pool and husband, William, Jacob Carroll and wife, Lyndsay and Kathleen Cahoj and husband, Wayne; two step-grandchildren, Jason Rieck and Beckie Collins; seven great-grandchildren Melody, Kaleb, Taylor, Noah, Anniston, Alivia, and Sutton. Visitation will be held from 6:00 until 8:00 p.m., Monday, at Robertson-Drago Funeral Home. Memorial contributions may be made to St. Jude’s Children’s Research Hospital and may be left at Robertson-Drago Funeral Home. I’m sorry for the loss of your stepfather. I am so sorry for your loss. EH was an incredible man that meant a lot to my family. My grandpa, Donald Bean, thought so much him. My brother, Leon Whisenant worked several years for E.H., and thought a lot of him. As days go by, may your sorrows turn into happy memories.